Last week I attended the East and Southern Africa regional implementation workshop in Livingstone, Zambia. These events provide an excellent opportunity to learn and share. One of the best parts of these events are the the field visits. The organizers were so generous and offered us six sites to visit. As a development worker interested in nutrition, I opted to visit the Nabuyani Small Scale Irrigation Scheme which was built in 2006 to improve food and nutrition security of the local community. 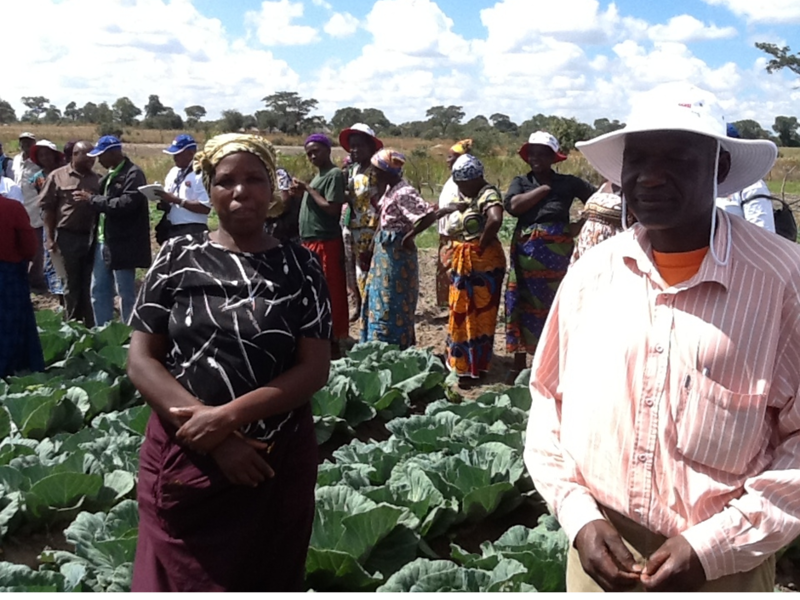 Sixty women and men farmers in the Kalomo district in the southern province of Zambia benefit from this irrigation scheme. The female beneficiary in the picture was ecstatic with her 30x50 meters farm plot and described it as “an office that generates regular income regardless of dry season, rain unavailability.” “I am always busy in my office and thanks to the project, I have managed to secure an income, become more food secure and play an active role in rural development”. I was so happy to hear her talk about how she grows cabbage, tomato, maize, green beans, potato in her farm while her husband is busy in the fish pond. As an expert farmer she told us that she practices rotational cropping system. When we asked her what was the impact of the irrigation scheme on their food consumption, she said: “look at me, don’t I look healthy, I can afford good clothing now and can afford post-secondary education for our two daughters in the city’’. As a nutrition professional, I was curious to find out what was their usual household dietary pattern. She told me that they had sweet potato and tea with milk for breakfast; lunch was Nshima (Cornmeal) and soya relish with vegetables (cabbage, tomatoes, green pepper and onions) while dinner was Nshima with groundnut relish and pumpkin leaves inclusive.. Despite the fact that her husband had fish pond, their diet was 100% vegetarian. One of the many challenges facing farmers is market and food price fluctuations. This is why market price is a key factor determining the choice of crop to grow. Last year she experienced low market price for her cabbage, at the same time, she was able to contain post-harvest loss as she sun-dried the surplus cabbage cultivated. What still needs to be seen is the impact of improved post-harvest technique on nutritional-value of crops. This field visit reinforced my conviction that as development workers, we need to design and implement nutrition-sensitive intervention for food processing and create market linkage to sustain the efforts and aspiration of ensuring food and nutrition security for rural people.